A Tall Order - The Scuttle of the Nash - Global Diving & Salvage, Inc. 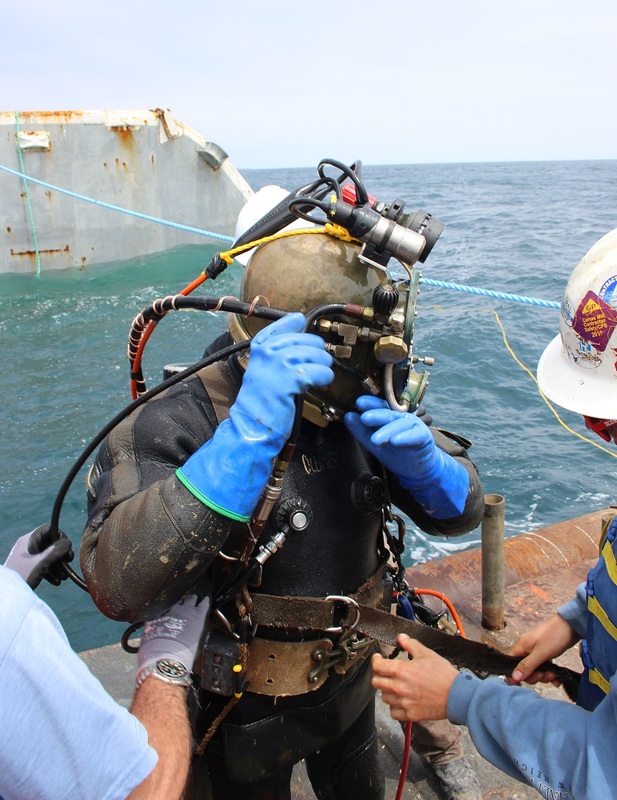 Global Diving & Salvage, Inc. responds to emergencies worldwide. Although no two marine casualties are ever exactly alike, most have the same goal – to get a distressed vessel out of the water or back to sailing, one way or another. However, the Nash was one that turned convention on its head, in more ways than one. In June 2014, the 260-foot long barge Nash was being towed from Mexico to Canada. It held a cargo of magnesium chloride, a non-hazardous derivative of seawater. The barge began taking on water just off the coast of Santa Barbara, CA. Water began entering the Nash at the stern, causing the rear of the vessel to sink. Because magnesium chloride is a very dense liquid, much heavier than water, the cargo tanks had been left partially empty when the cargo was loaded to aid with the buoyancy of the barge. As the barge took on water, the forward cargo tanks stayed intact and contained enough air to prevent the nose of the barge from sinking. When the barge finally came to rest, it was “aground” vertically. 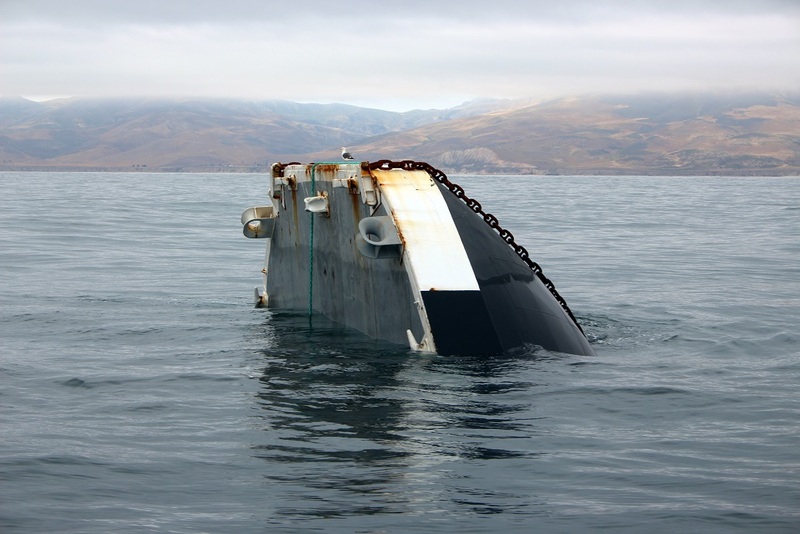 Its stern was embedded in the sandy sea floor, while the bow of the boat remained out of the water at a 90-degree angle, 235-feet above. “When a vessel sinks, it sinks. It goes to the bottom. If it capsizes, it rolls over. I don’t even know what you call what happened to that barge,” said Global Salvage Officer Kyle Watson. The barge’s owner called Global directly for help with the sunken vessel. The Nash was extremely unstable while in its vertical position, and the vessel was situated close to two highly sensitive areas. A half-mile in one direction was an active oil and gas pipeline, and a half-mile in the other direction was a protected marine area. If the barge shifted one way or the other, the results could be devastating. 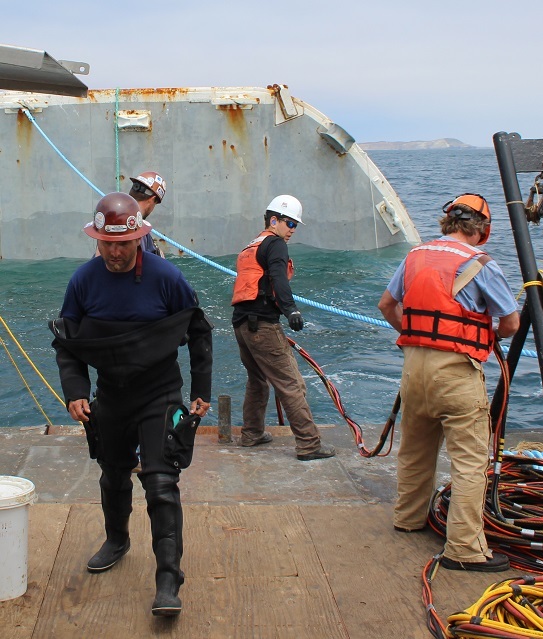 The vessel needed to be moved, but determining the best method for removal was challenging without knowing how badly the hull and cargo tanks were damaged. An investigative dive was too risky due to the instability of the Nash, and setting up deep diving equipment can be a lengthy process. Instead of a diver, Global sent a remotely operated vehicle (ROV) to the ocean floor to become the eyes of the operation. Video from the ROV revealed that the Nash imploded as it sank. As the stern sank deeper, the pressure difference between the seawater on the outside of the barge and the air on the inside of the cargo tanks caused the aft tanks to implode, leading to catastrophic failure of the hull. “It became pretty clear that refloating the barge in its entirety was not an option,” said Watson. As an alternative, Global called the Environmental Protection Agency for emergency permission to legally dump Nash. After hearing about the situation and determining there were no hazardous materials onboard the barge, the EPA issued a permit to Global and provided coordinates for a safe dumping site 12 miles away from the original wreck area. The job was unusual on many levels, including who was in charge. The barge owner asked the salvage company to represent them in the unified command – a position typically held by the Coast Guard. In this case, Global was the incident commander, leading the effort with oversight from the Coast Guard, state and federal agencies, and stakeholders. If there was a communication breakdown at any point during the project, one of those agencies could have taken charge, but the need never arose.